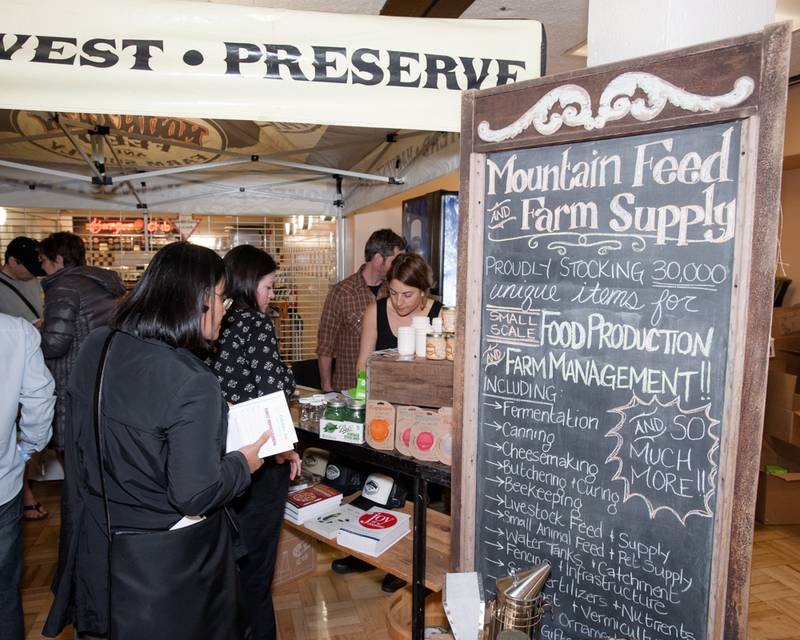 Community Cuisine offers classes, lectures, and special events that bring the community together with chefs, nutritionists, farmers, artisans, and food activists. We are a gathering place for culinary arts, food traditions from the past, and wisdom from the rich cultures of our community. We are based in the San Francisco Bay Area, but we can travel to your community! Fill out the contact form and let us know about your event! 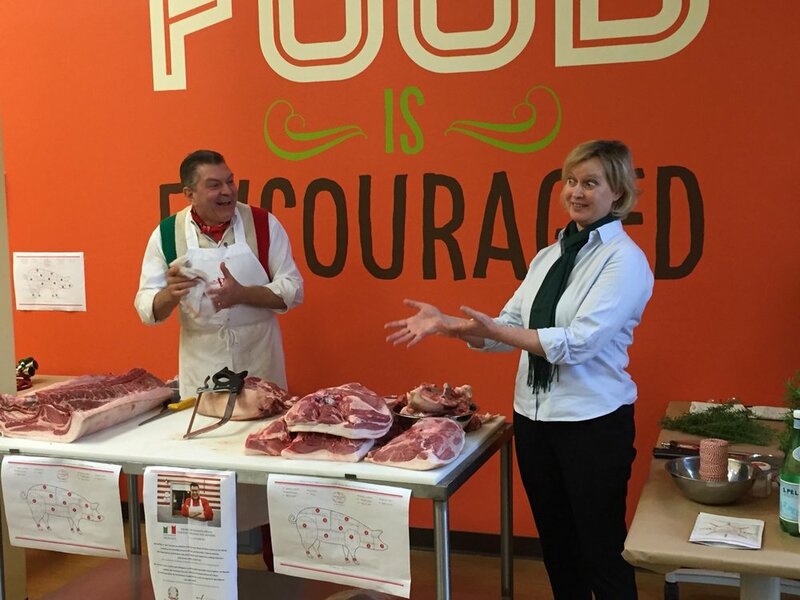 It was an honor to be asked to host Dante-quoting Dario Cecchini in San Jose. Dario is the leading contemporary internationally known Italian butcher from Panzano in the Chianti region of Italy. 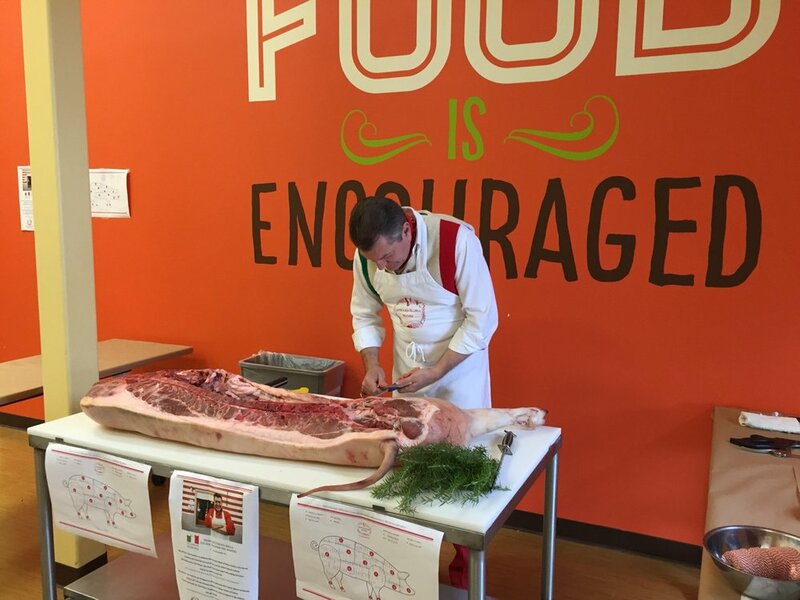 In his butchery demo, Dario broke down half a pig while discussing his passions and philosophies. 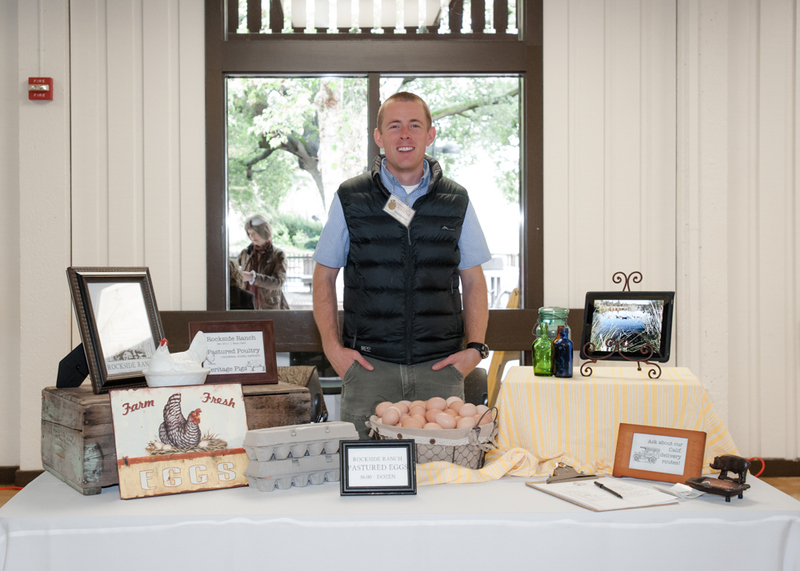 He also shared recipe tips while we tasted sumptuous preserved pork dishes and sipped Prosecco, thanks to our co-sponsor New Seasons Market, Evergreen. It was a fantastic day and extremely inspiring to the chefs and home cooks in attendance. "My name is Dario Cecchini. I’ve been a butcher for eight generations, father to son. I try to maintain the high values of my work and my family’s traditions. I always say that a man is like a tree: he must have his feet, his roots, planted firmly in the earth,traditions; and his head, the crown of the tree, must be in the sky, in the contemporary world. Having respect of the animal, of it’s life, of it’s death, and using everything to the very last tendon with conscience is what I have been doing every day for the past 40 years. 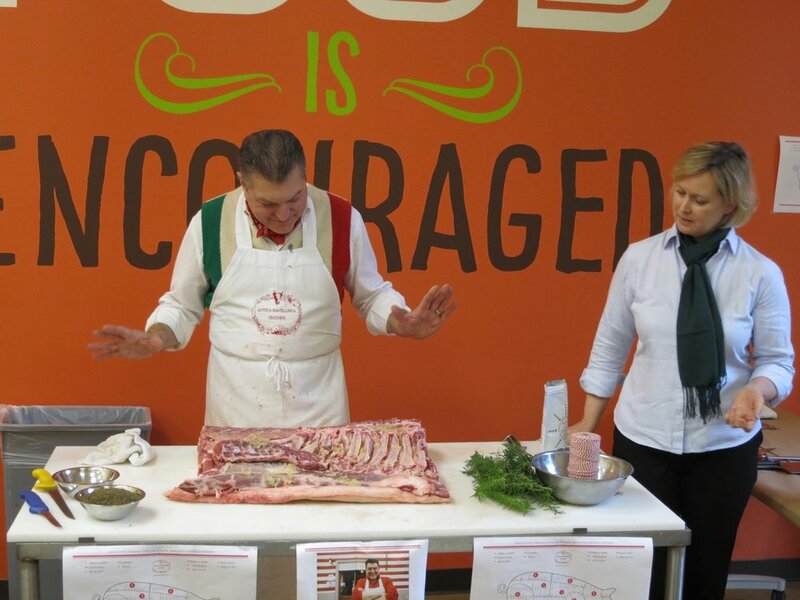 This is me: my name is Dario Cecchini and I’m a butcher from head to tail. My beef and my pork aren’t of any specific breed and they are raised in Catalonia, Spain, by people that I have known for over 20 years and that I trust deeply. Sometimes the beef might be of the Chianina breed and it comes from the Manetti family in the splendid Fontodi farm in Panzano in Chianti." 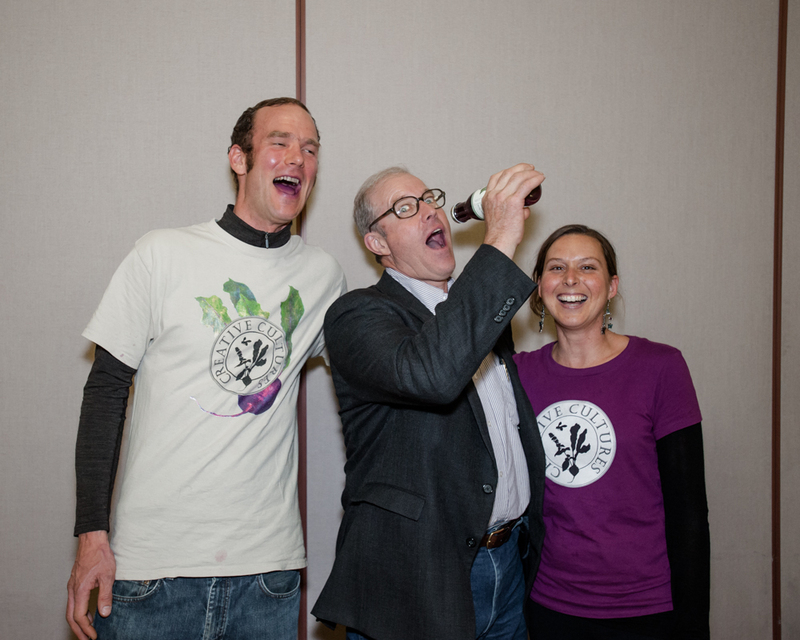 In the afternoon, Joel’s talk, “think outside the (CSA) box,” was directed to farmers and food producers. Joel discussed ideas to help farmers and professional food folks focus (say that 3 times fast) on thinking outside of the box to find ways to get their products in creative and convenient ways to us, the people who are hungry for healthy and delicious choices. In the evening Joel spoke passionately about our lost romance with dinner. Cooking dinner, he challenged, has been replaced with product-purchased, package-opened, reheated meals. Again Joel’s question, “what is our excuse for not feeding ourselves and our families a healthy, delicious dinner?” He told the story of “the soccer mom” who drove for hours to find the best coach for her child and stopped at McDonalds for his dinner. To quote Joel, “Folks, this ain’t normal!” He also discussed the connection with family and friends that can only be found around the dinner table. His message ties into Community Cuisine's core beliefs to be sure. The event also featured a fantastic array of food vendors. 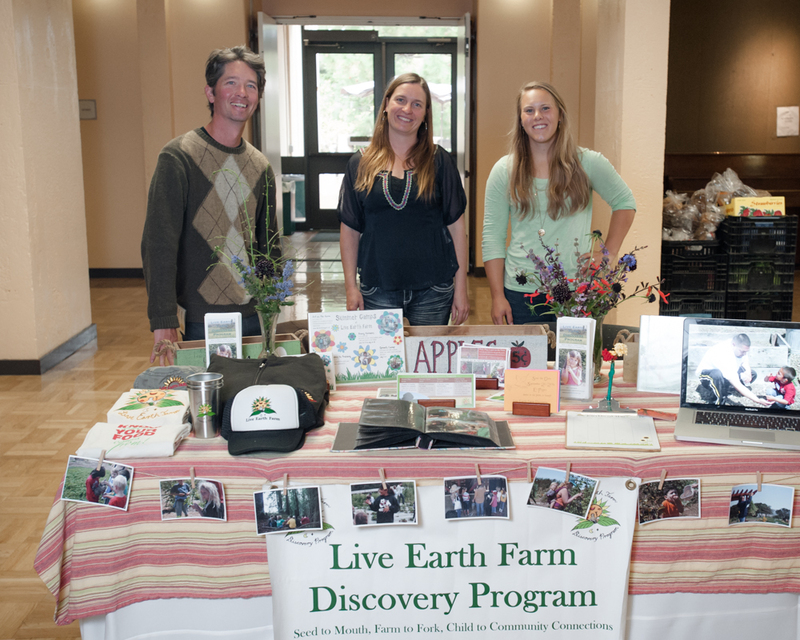 Local farmers and artisans offered grass-fed meat deliveries, vegetable CSAs, baked goods and more. These are the folks that can rekindle our romance with dinner. Community Alliance with Family Farmers told me that there are over 1,000 farmers in Santa Clara County alone. That is 1,000 reasons to buy produce that has a sticker that says “California” and not “Florida” on it! Monica Spiller of Whole Grain Connection, a non-profit organization based in Mt. View, aims to enhance the desirability and availability of whole grain breads and other whole grain products from organically and sustainably grown grains. Monica teaches Sourdough intensives, Roti, Biscotti and other classes. Building footbridges in rural Kenya is a bit like an Amish barn-raising. Everyone in the community has a part to play. The local villages and communities come together and provide the manpower to build bridges which save lives and allow access to schools, clinics, and the market. The purpose of JAMBO Gala was to raise funds to build three or more bridges per year and assist with general operating costs and equipment maintenance for Bridging the Gap Africa. This organization is close to my heart. 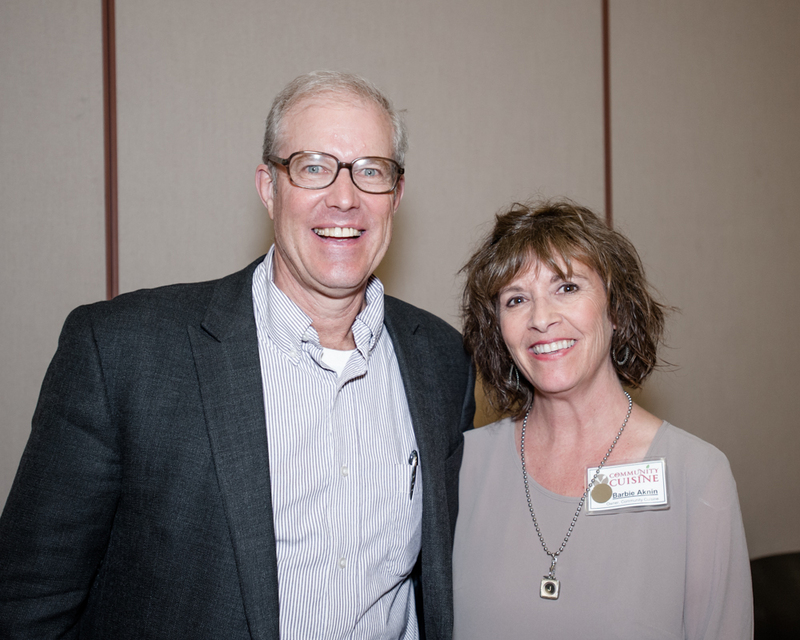 My husband and I have supported the work of Harmon Parker, founder of BtGA, for more than twenty years. When my husband lost his life to cancer, I knew that the best way to honor him would be to build a bridge that would save lives. This is what would make him smile. In 2012, I hosted our first JAMBO Gala to raise funds to build that bridge. Our second JAMBO Gala was held in 2014, both at The Tech Museum in San Jose, CA.